If you don’t currently have plans to use your recreational vehicles, don’t worry! We’re here to give you a little inspiration and a few good ideas for things you can do this summer that don’t necessarily require a lot of pre-planning. And if owning an RV or boat is still just a dream for you, we’re hoping you’re convinced to finally start shopping for that perfect one. But what about storing your vehicles and boats when they’re not in use? It’s true that concerns over where you will keep your boat or RV may be the main reason why you haven’t made a purchase yet. We’ve got you covered on that front, too! Read on for more about ways to enjoy your recreational vehicles, as well as securely protect your investment with a steel structure from Newmart Builders after the road has led back home. Here in the USA, we’re fortunate to live in the most ecologically diverse country in the world. This means that the area you call home is vastly different in terms of climate and geography from places that you can simply drive to within a few days or even hours. We have 14,000 ft. tall mountains, vast deserts, ocean beaches, scenic rivers, and even tropical islands (though you won’t be able to drive directly to those, of course) that we can all visit with no passport required. Have you visited all 50 states? Or are there entire regions of our country that you’ve never seen? Why not take your RV on the road and check out some unique sites this summer, like those in our National Parks? There are probably many you haven’t even considered as destinations. The best thing about our National Parks is that quite a few have easily accessible campgrounds within their borders and many more just beyond their gates. Plenty offer boating opportunities, as well. Let’s take a closer look. America’s National Parks really got started in the Western part of the country, as Yellowstone NP, in Wyoming, Montana, and Idaho was our very first, and the first in the entire world when it was formally created in 1872 by President Ulysses S. Grant. Yellowstone is still an excellent destination today for campers and boaters and features 12 campgrounds with over 2,000 sites. 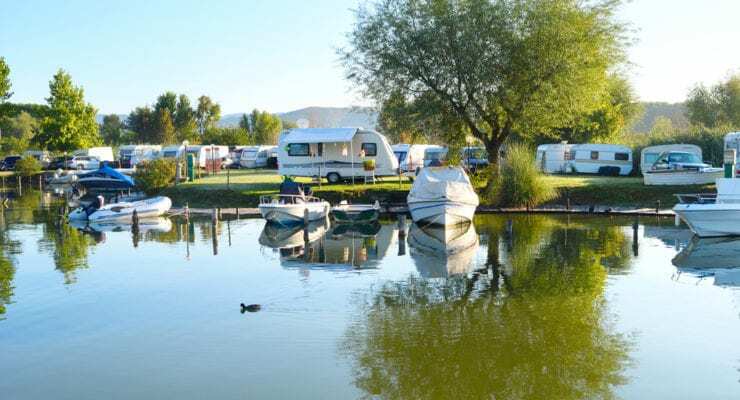 The Fishing Bridge RV Park in Yellowstone is specifically for hard-sided motorhomes and campers, in fact, and features full hookups. Beginning on the Saturday of Memorial Day weekend each year, Yellowstone’s boating season opens, and motorized boats are allowed on two lakes in the park: Lewis Lake and Lake Yellowstone. After Yellowstone, there is a variety of other Western National Parks you shouldn’t miss visiting with your RV. These include Badlands NP in South Dakota, Grand Canyon in Arizona, Redwood and Yosemite in California, and Denali all the way up in Alaska. While traditional boating isn’t available in Badlands, Grand Canyon, Redwood, or Denali, some of these parks are close to large water recreation areas beyond park boundaries or offer non-motorized boating activities like kayaking. RVs will be at home in all of these parks in one way or another. Although many are arguably less famous, the National Parks located east of the Mississippi offer a wide range of options for RV enthusiasts and boaters alike. Especially if you’re a boater, you have many options for fun in parks like Acadia in Maine, which is surrounded by water on Mount Desert Island, or the Everglades and Dry Tortugas in Florida. In fact, Dry Tortugas National Park can only be accessed by boat, and bringing your own boat to this park in the beautiful Florida Keys will offer you the most exploration opportunities! Along the entire East Coast, boating opportunities further abound in countless bays, lakes, and rivers that may be right in your backyard. And this brings us to our next suggestion for summer fun—the Staycation. Here at Newmart Builders, our location in southern Virginia is close to many outdoor recreation opportunities, and we know that you don’t have to go far away from home to enjoy your RV or boat. Virginia Beach and the Hampton Roads area are some of our favorite destinations for day trips. What are some interesting recreational areas within a few hours of your home? Just grab a map and look around, or even pay your local tourism bureau a visit to get some ideas. From state parks to campgrounds and boat launches that might be hiding in plain sight just minutes down the road, take a few days to play tourist in your local region. We guarantee you’ll be surprised at the number of unique and fun opportunities that exist to play with your expensive toys near home. You may even discover some favorites to visit again and again. When the fun is done, and it’s time to put your RV or boat away, either for the season or just for a few days before your next adventure, where do you typically store it? Did you find yourself having to extensively clean your RV’s exterior before you could begin prepping for your vacation this year because it had been parked outside under a tree all winter? You can skip that hassle in the future with a metal storage building or open-style covered structure to keep your vehicle protected from the elements. Our RV & boat storage building options are sturdy and much more affordable than you’ve probably imagined! And you can choose to construct your storage building yourself, have a professional contractor do the heavy lifting for you, or even have our installation experts deliver and assemble your new building. Not sure where to begin on sizing, style, or features that your RV or boat storage structure should include? Our previous blog post about selecting the best structure for your particular storage needs is a great place to start. And then just browse through our photo gallery to get a sense of how versatile steel buildings genuinely are. Whether you’re looking for basic open-sided, covered storage that is easy to drive under and protective against even harsh weather, or you want a more secure, enclosed building with locking doors to guard against theft, we have options that are sure to suit your needs. Get in touch with us today to start the conversation about protecting your prized recreational vehicles. Previous Previous post: What is the Best Structure for Your Needs?